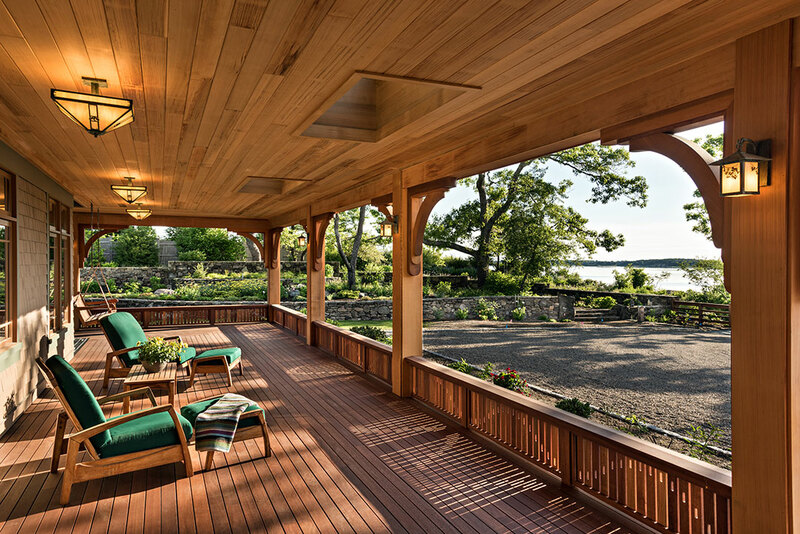 In 2016 we had the honor of completing a new home of extraordinary dimension that challenged and inspired us and exemplifies the capacity of the firm to integrate engineering, science, art, design, and the sacred in the creation of an enduring structure of beauty and functionality. 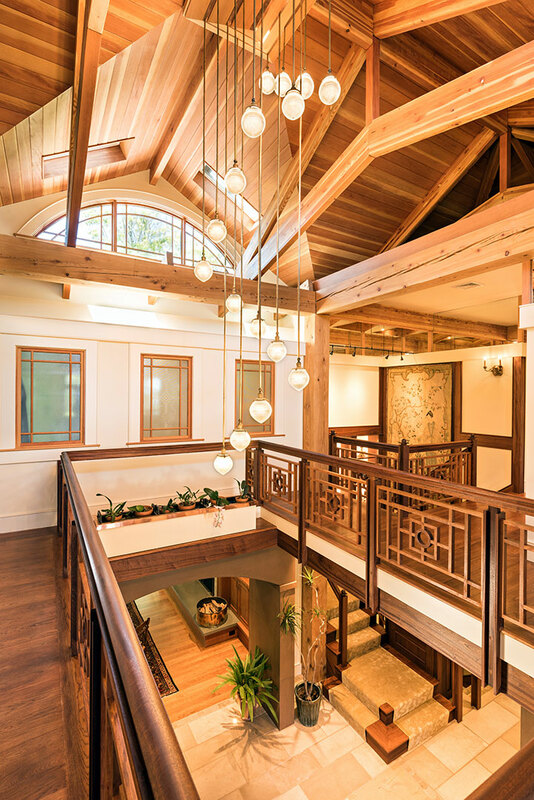 This home is a contemporary Arts and Crafts style building, exhibiting extraordinary craftsmanship and integration of art, with state of the art materials and systems used to achieve the standard of Gold Certification of the LEED for Homes Program, all grounded in the ancient system of architecture known as Vastu. 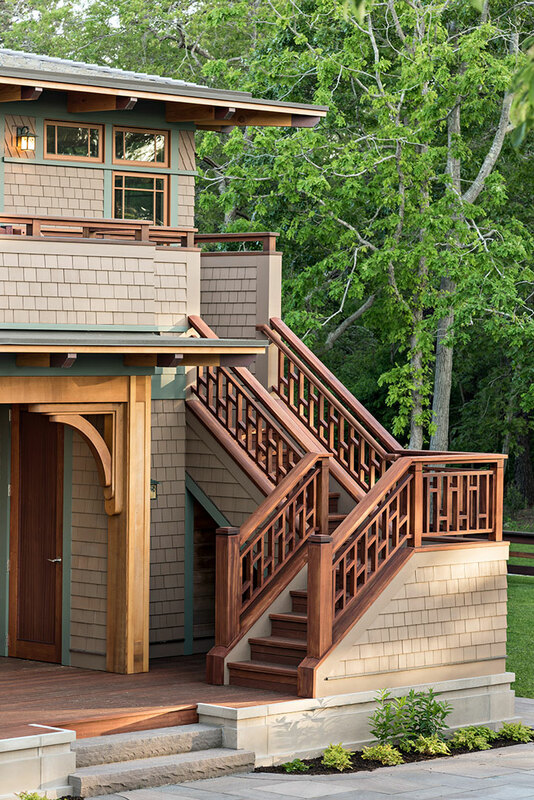 And it was built on an environmentally sensitive bluff on Cape Cod. 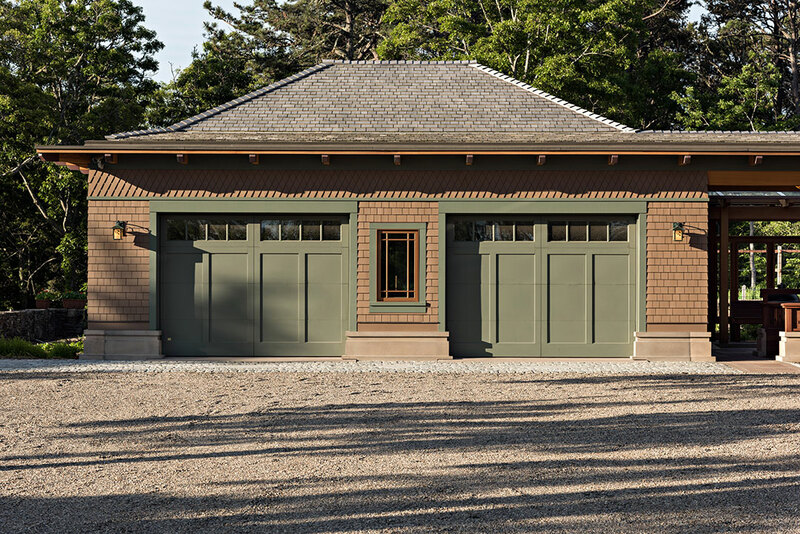 The Clients commissioned us to design and construct a new 7,000 sf home on a pristine 2.68-acre site on Cape Cod. 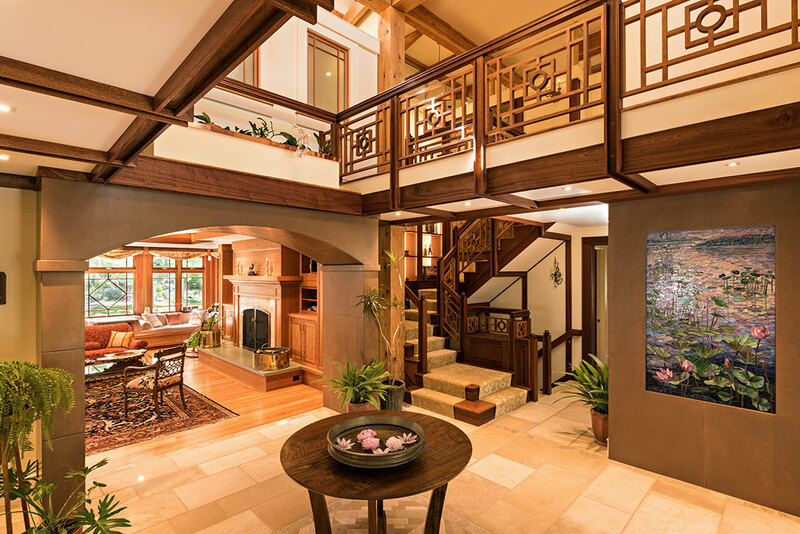 In addition to a list of preferences and features generally expected in developing the program for a custom designed residence (such as accommodation for an extensive art collection, and an interest in growing their own food) the Clients wanted a home based upon Vastu architecture. Vastu or Sthapatya Veda is an ancient tradition associated with building in accordance with natural law, and establishing a relationship between the owners, house and/or building and cosmic order. The goal of adopting such a program is for the building and its immediate surroundings to have a nourishing influence on the occupants. This result is achieved through adherence to alignment with the sun, proper horizontal and vertical dimensions, the use of natural, non-toxic materials and interior finishes, and myriad specifications relative to location of functions, services, electromagnetic fields, as well as the influence of the surrounding environment, and auspicious timing. 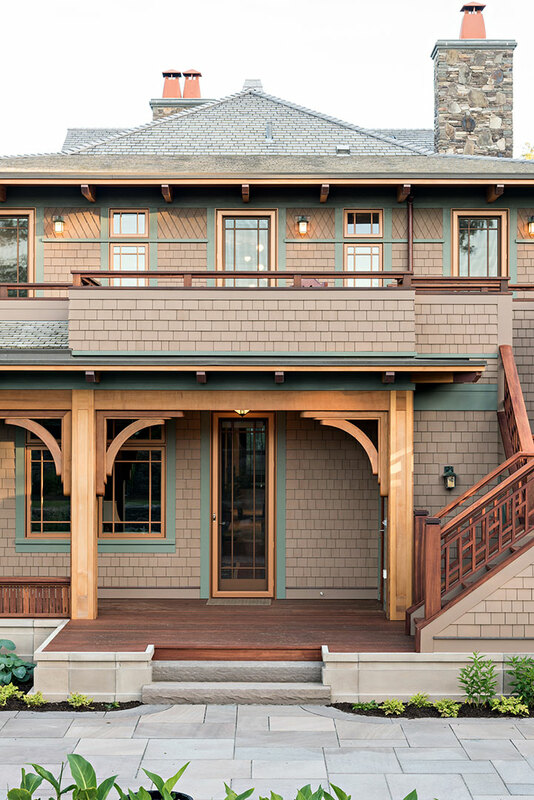 An Arts and Craft Style, Post and Beam House. 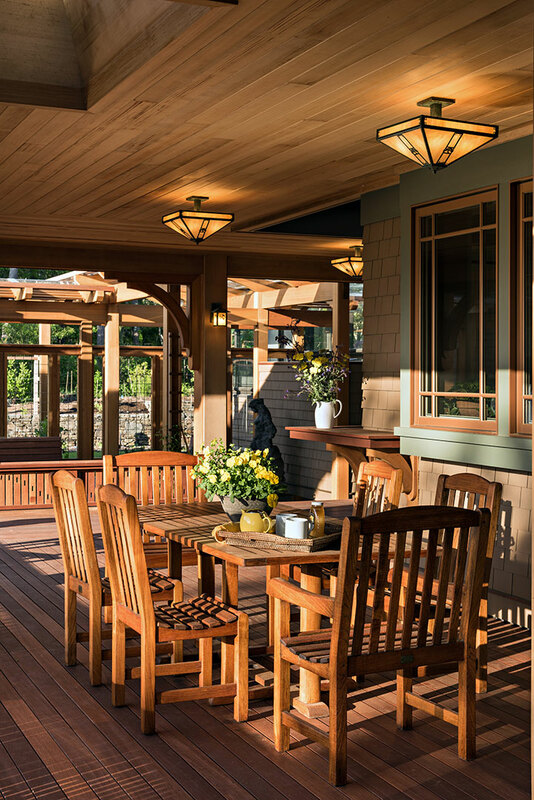 The owners stressed the desire for a cohesiveness of decor and simplicity of style inside of the home, as well as the exterior appearance and grounds. 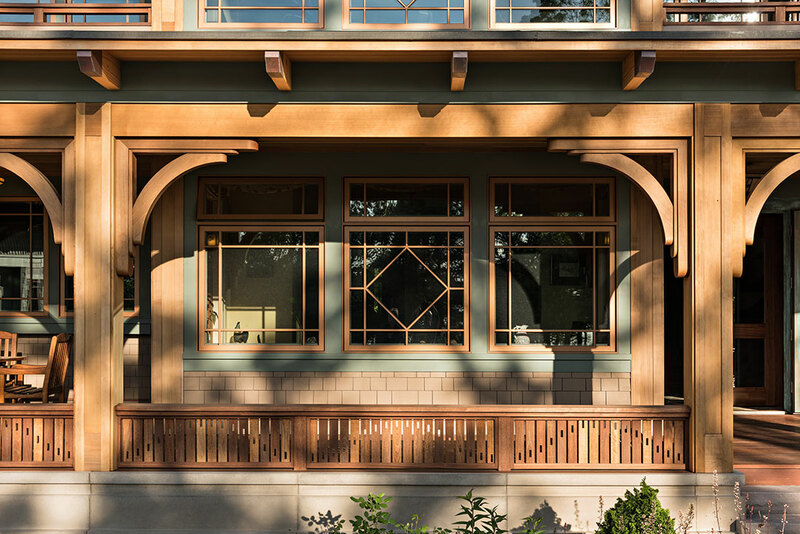 As the Arts and Crafts Movement was concerned with spiritual connectivity with one’s surroundings — both natural and manmade — it made sense that an Arts and Crafts style home would complement the Vastu program, as well as the sensitive environment. 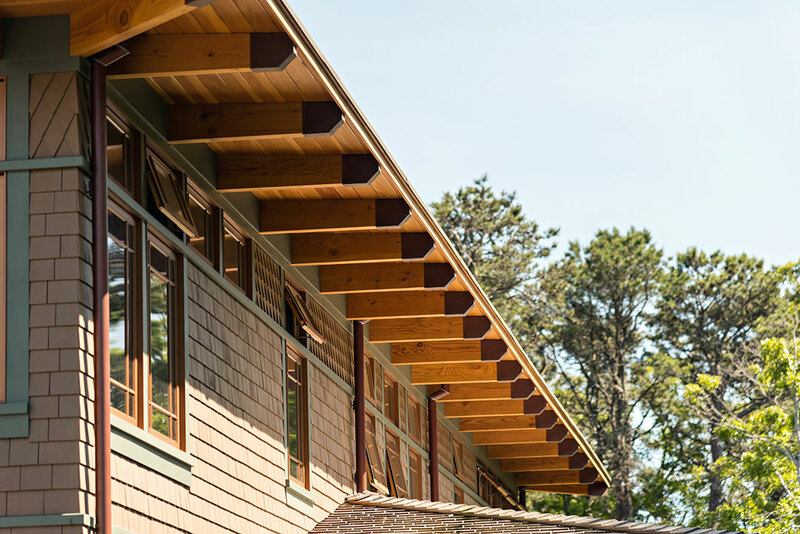 The building achieves its low, sensitive relationship to the rolling site through the utilization of horizontal lines expressed by the wrapping of the main two-story house with wide open verandas and incorporating large overhanging rooflines, horizontal banding with decorative shingling and trim, and broad bands of casement windows. Stone walls and horizontally formatted fences and gate surround the building complex and define the more manicured gardens from the more natural landscape and meet requirements of the Vastu program for a rectangular enclosure in the form of a wall or fence at very specific dimensions from each side of the building. 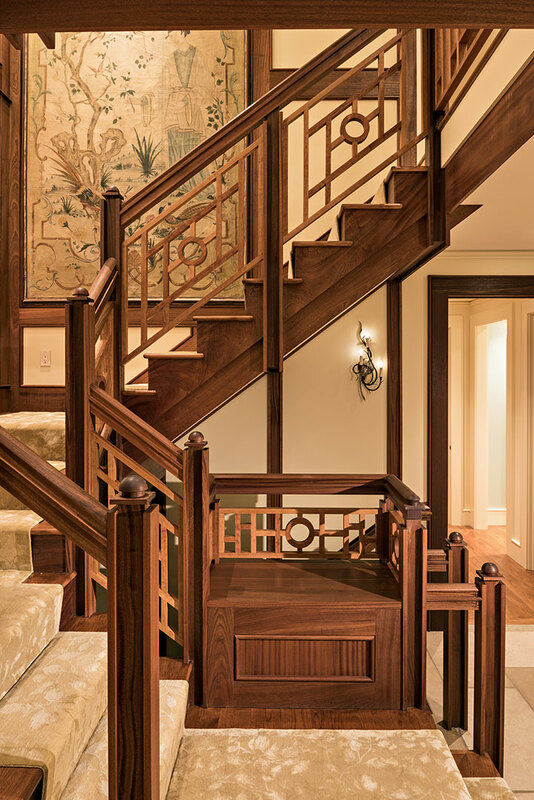 In plan, the strict adherence to the Vastu program and the flowing openness typical of an arts and crafts style home resulted in a formal design that is zoned per function and carefully arranged around the central hall or Brahmasthan. The central space makes reference to an external courtyard with clerestory lighting, a stone floor, an impressive staircase, balconies, internal windows, the etched glass doors of the entry, and three monumental concrete panels – one with a glass mosaic of lilies, another with a niche for sculpture, and the last an archway leading into the living room. The formality of the plan gives way to feelings of openness and interpenetrating space in part because of two main circulation spines, north-south and east-west, which intersect in the center of the Brahmasthan and divide the house into quadrants. 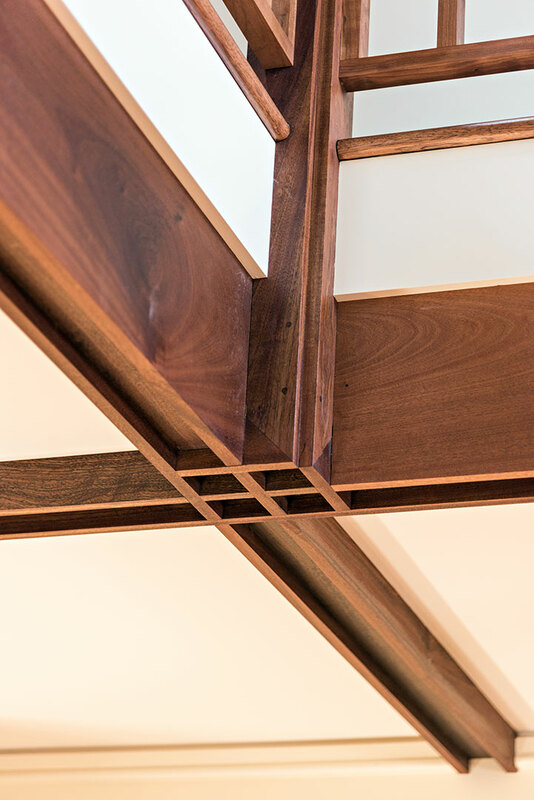 These circulation spines termed “axes of light” must remain unimpeded except by moveable doors or windows and give clarity to the interior layout. 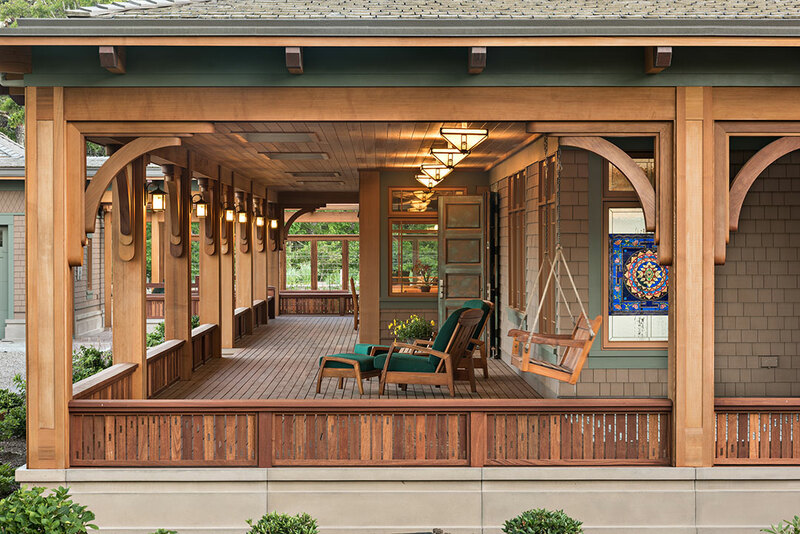 Expressed structure, hardware, stained glass, mullion patterned windows, lighting, and rugs were carefully selected to create a harmonious composition, each individually beautiful while also enriching the overall design. Cooking and sharing exotic meals from many cultures of the world is very important to the family. Consequently, the kitchen and ancillary spaces were carefully planned. A greenhouse is connected to the house on the south side, with a separate herb pantry and root cellar within the house, with gardens adjacent. The desire for an open fire bread oven was incorporated into the design and was positioned at the heart of the house just south of the Brahmasthan. The “family nook” is a gathering space within the kitchen, including a bump out with a banquet designed around a large custom-made table. Artists were commissioned from all over the world and locally to create art pieces, custom tiles, sculpture and furniture that was custom designed for the house. 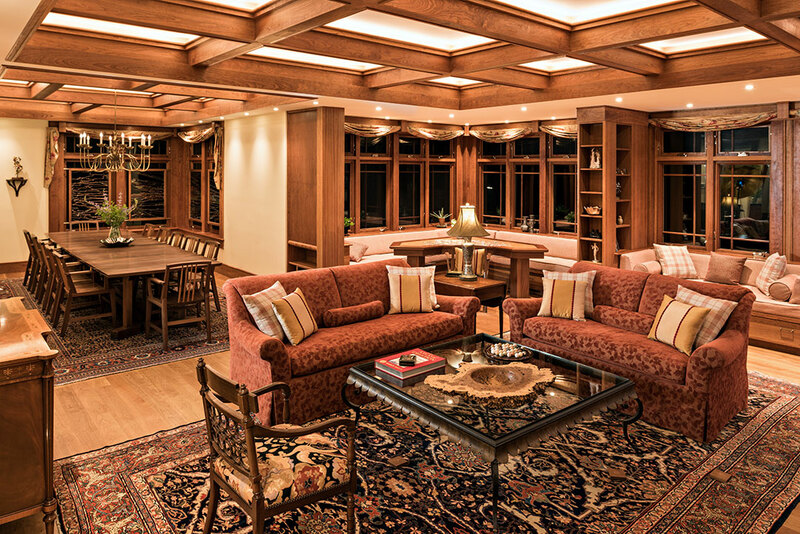 Additionally, the house was designed to accommodate a collection of art pieces, furniture, rugs, and precious objects that had been a cherished part of their previous home. Building Materials and Systems. It was the desire of the owners to create a home which would be designed, built, and certified per the ancient principles of Sthapatya Veda and would also meet the standards required to achieve gold or silver certification through Leed for Homes or NAHB Green programs. Drawn to the aesthetic of the soaring and expressive post and beam structures found in turn of the century barns and as the use of large quantities of structural steel is discouraged by Vastu, part of the challenge of the project was developing a large timber framed structure that would meet code requirements for static and dynamic loads. In the end the central post and beam structure in the Brahmasthan was fashioned from hemlock trees felled from the owners’ prior home. 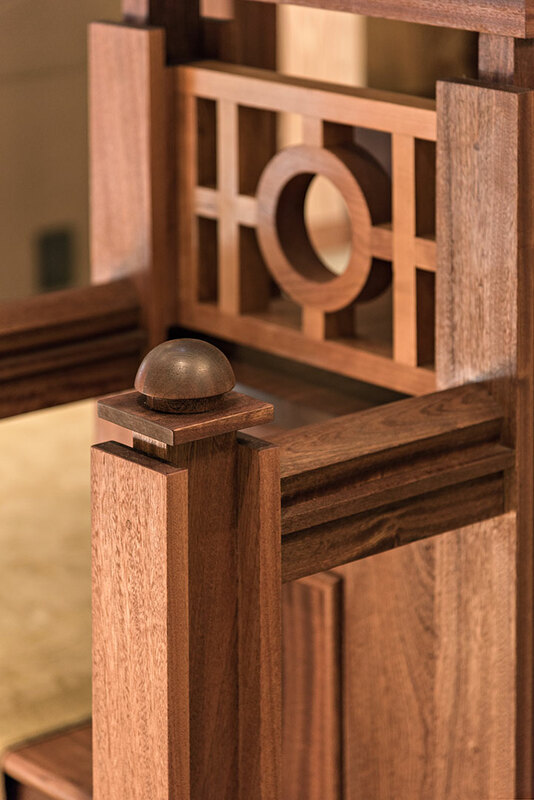 All fasteners had to be concealed upon the owners request so great care and precise workmanship was required to achieve the look of mortise-and-tenon joints. Several Poplar trees also located at the owners’ home were felled and milled and used for a good portion interior trim. To satisfy the Vastu requirements for a construction system that had mass and solidity, a double stud wall was adapted for the external walls. This had the added advantage of allowing for a thicker application of non-toxic cellulose insulation to be used in the walls and satisfy local energy code compliance for R-value (or heat flow resistance). Another requirement is to create a plinth around the entire perimeter of the building with a very specific profile and dimensions made from a solid material such as stone. The architect selected pigmented precast concrete as the material for the plinth to control costs and to take advantage of the skills of a local concrete craftsman who could assure dimensional accuracy in the fabrication of the pieces. Non toxic “green” materials were used throughout the building. In the roof above the bedrooms, 8 inches of cork were used as insulation to achieve an R-value of 30. 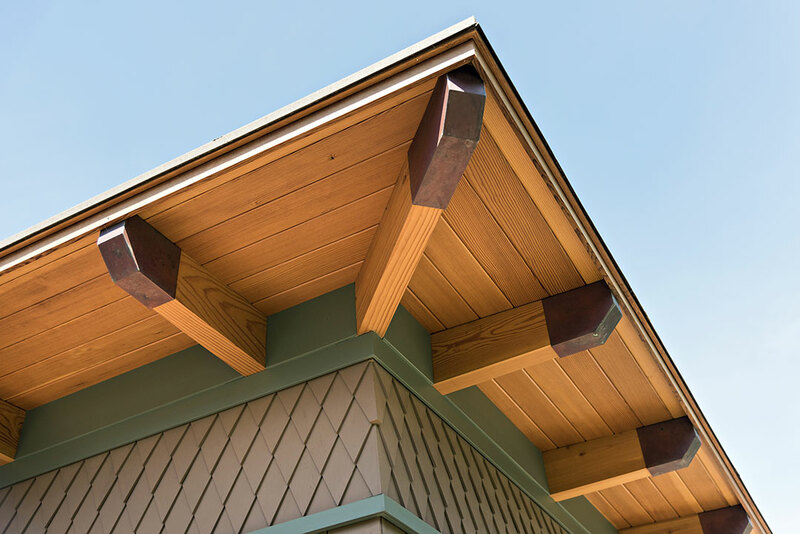 Over the Brahmasthan, a combination of structurally insulated panels and traditional stick framing with rigid insulation was used. An open loop geothermal heat pump heating and cooling system was installed. This type of system uses well or surface body water as the heat exchange fluid that circulates directly through the ground source heat pump system. A highly efficient propane fired boiler was installed as a backup. 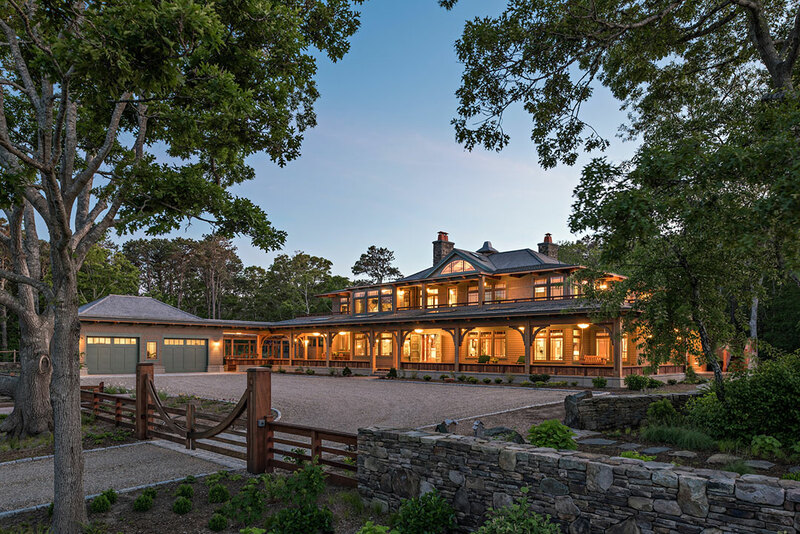 A 23 zone hydronic radiant heating was installed in the floors throughout the house and a ducted central air conditioning system was installed for cooling and humidity control. To allow the building to breathe while still controlling moisture penetration a system of smart vapor barriers and tapes (Intello plus and Tescon Vana and Mento plus tapes) by Proclima were incorporated into the envelope of the building on both the interior and exterior faces.